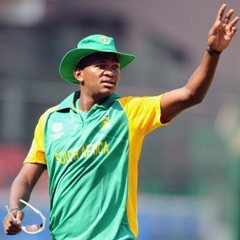 Cape Town - Proteas seamer, Lonwabo Tsotsobe has been ruled out of the current KFC International T20 Series against New Zealand with an impingement syndrome of his right ankle. Proteas Team Manager, Dr Mohammed Moosajee said: “ Lonwabo complained of pain to his ankle yesterday during practice after bowling 10 balls. He was sent for an MRI scan which revealed bony bruising of the talus bone at the back of his ankle joint. The selectors will decide in due course if a replacement will be named.